To weave means ‘to lace together threads, so as to form a fabric’ and also ‘to form by weaving,’ like you can do for example with a basket or some outdoor furniture. Spiders, and other small insects, weave webs. Figuratively, to connect and combine things as a whole is also to weave and also to move by zigzagging or winding. 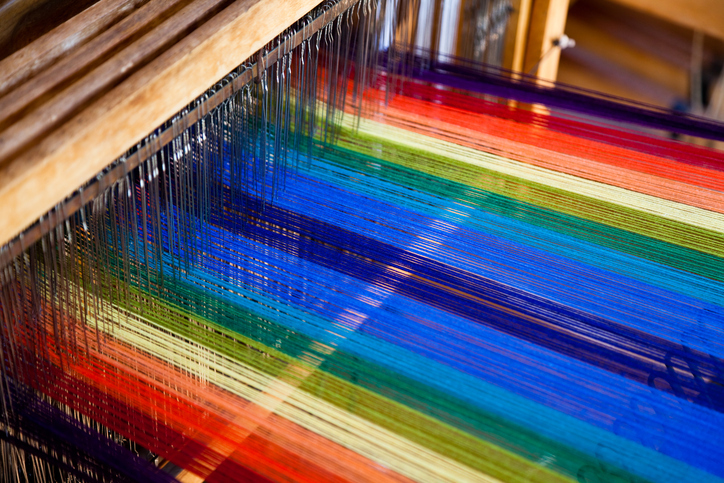 As a noun, a weave is a pattern or a method for weaving. Workers were weaving threads into fabric on great looms. Laura sat in the sun, weaving a basket. The spider wove its web. The author has woven a tale of wonder. The motorcycle was weaving through the traffic. I particularly like the weave of this fabric. Weave dates back to before the year 900. The Old English verb wefan, later the Middle English weven, originally meant ‘to weave or form by interlacing yarn or thread.’ It can be traced back to the Proto-Germanic weban and the Proto-Indo-European root webh-, meaning ‘to weave’ and ‘to move quickly.’ It is related to the Old Norse vefa, the Middle Low German, Middle Dutch and Dutch weven, the Old High German weban and the German weben, all meaning ‘to weave,’ as well as the Persian baftan (to weave), the Greek hyphe, hyphos (web) and the English word web. The sense grew to include ‘to combine into a whole’ by the 14th century, while the meaning ‘to move by twisting and turning’ dates back to the mid-17th century. A second verb use for weave dates back to around the year 1200, with the meaning ‘to move from one place to another.’ Some linguists think it developed from the main verb, while others think it was separate (though it came from the same Proto-Indo-European root, webh-, and its secondary meaning, ‘to move quickly.’). In either case, this sense expanded to include ‘to move back and forth’ in the early 14th century, and ‘to move side to side’ in the late 16th century. In modern English, it has merged with the sense ‘to move by twisting and turning,’ so they are now considered all meanings of the same verb. The noun comes from the verb and, meaning ‘something woven,’ dates back to the late 16th century. The meaning ‘a method or pattern of weaving’ is from the late 19th century.